It looks like the sea snot, or Australian droplet tunicate, is slowly degenerating for the winter, but there are large numbers of juveniles which may stay in a dormant state until the spring. The Australian droplet tunicate is still abundant at Sandspit, but appears to be degenerating with the onset of winter and cooler temperatures. Photo: 1 May 2014. 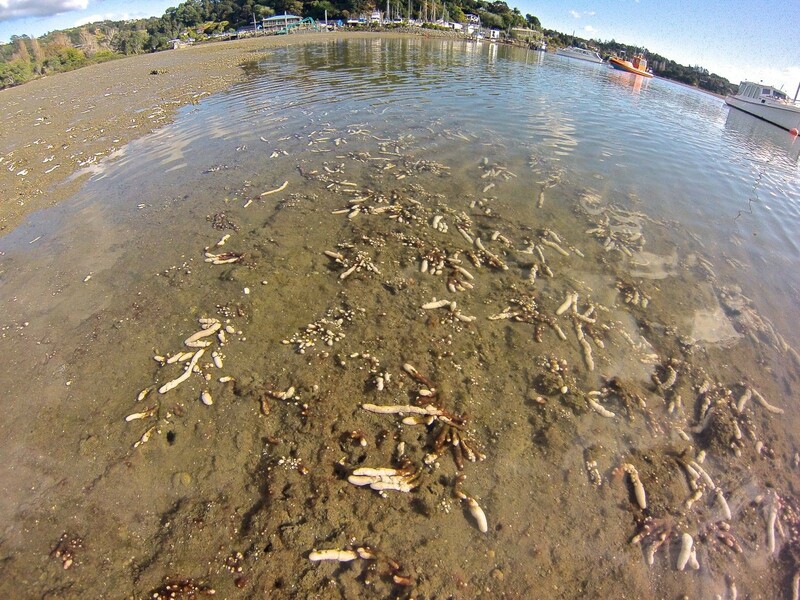 Jon Nicholson from the Sandspit Yacht Club Marina Society has assured us that the various marine invasive species found at Sandspit within the proposed marina footprint will not be spread by dumping the dredged spoil at sea because of the technique they intend to use for dealing with the dredged material (Mahurangi Matters, 19 March 2014, page 7). Figure 1. Large quantities of highly invasive Australian droplet tunicate festoon the low tide and shallow sandstone reef in the Sandspit estuary, including the footprint of the proposed marina. Although tunicates may be killed in the stockpiling and draining process before dredgings are shipped to Great Barrier island, there is still a huge risk of larvae settling on the bottom of the barges themselves while being loaded at Sandspit. 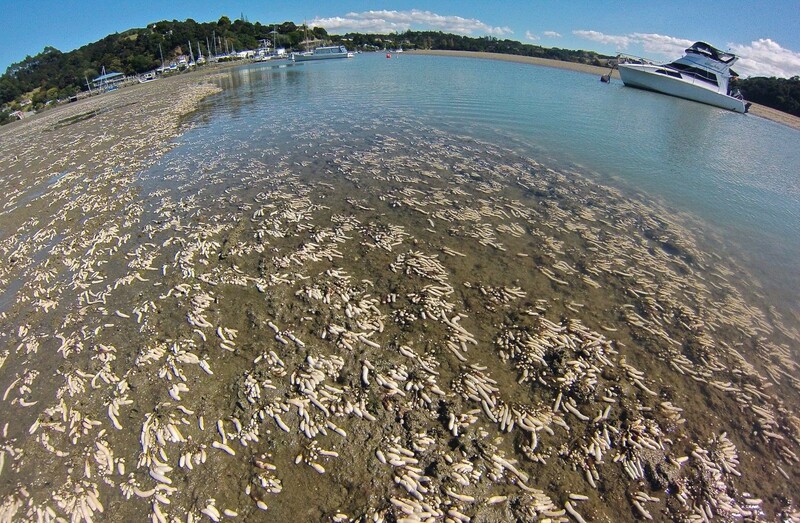 Tunicates attached to the barges would then release larvae all the way across the Hauraki Gulf to the dump site and return. (Photo: 8 April 2014).